There is even opposition to changing the “definition of woman!” Shall we add a definition of man? Interesting column in the Business section of the Boston Globe by Shirley Leung! She reports on organizations in the business community who oppose efforts to pass the equal pay bill. They are vowing to fight the bill in the MA House, and it appears there are some legislators on both sides of the aisle who are listening. But before we get to that, let’s consider the atmosphere we face. A couple of weeks ago, the Herald published an editorial opposing the bill. Surprise? No. The editorial was sprinkled with misrepresentations and bending of truths; it read like a transcript for a Rush Limbaugh show. Among other things, the Herald opposed removing the definition – currently on the books – of a “woman” as a female over 18. To understand the folly of the “pay equity” bill about to come before the Senate, consider that the legislation would redefine the word “woman.” Yes, it’s that prescriptive. Technically the legislation eliminates the definition of a woman under existing state labor law (current definition: a female 18 or over), presumably so that “women” under 18 can enjoy the new protections this bill would offer. And it just gets sillier from there. Females under 18 would now be able to exercise their right to equal pay? Horrors! As if this is a wild and outrageous idea. Here’s an idea. Let’s amend the current law and add the definition of “man” as a male over 21, because we all know that boys mature slower than girls. The Globe column describes the efforts made by the Boston Area Chamber of Commerce to poll their members then work with legislators to make small changes that were most important to local businesses. They came out in support of the law. Noble? That’s a term used in medieval times, and maybe that’s the world the council lives in. I love how this group anoints itself an authority on closing the gender gap. This from an industry that is famously unfriendly to women. How soon we forget venture capital executive Ellen Pao and how she put the tech world’s sexism on trial with her discrimination case against her employer. “It is powerful for the business organizations to be aligned on something. I get that,” Rooney said. “I am not going to wait for that.” Thank you Jim, for recognizing that we live in the 21st century. Leung’s column also shares quotes from Speaker of the House DeLeo and Governor Baker noting that they are skeptics. Great, the Speaker of the House. We will include his contact in our information as we formulate messages to the MA House. He might represent a district, but as speaker, he represents ALL OF US. This all sounds reasonable until you start looking at how far women have come, yet how little they still earn. 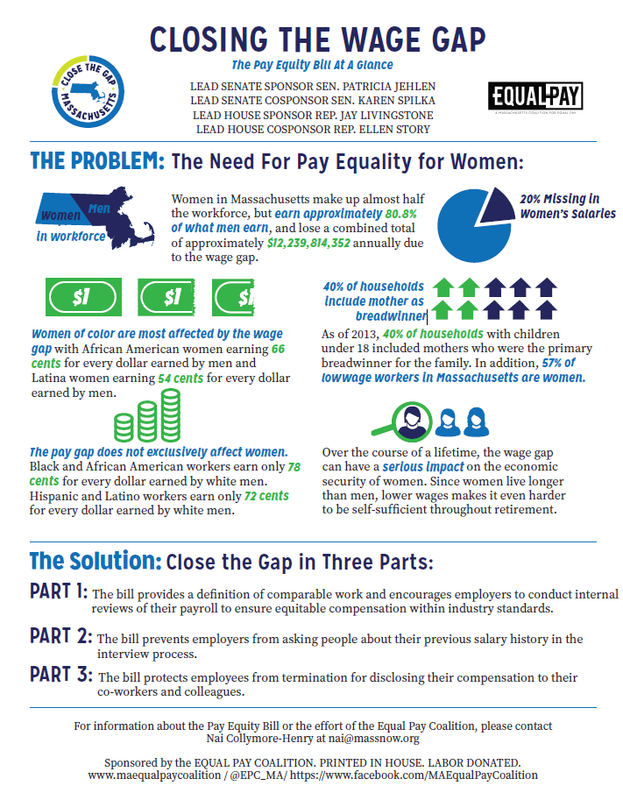 Women in Massachusetts make up almost half the workforce, and 40 percent of households with young children have female breadwinners, according to the Equal Pay Coalition, a group formed to support the pay-equity bill. Yet women in Massachusetts on average earn just 82 cents for every dollar a man makes, according to the National Women’s Law Center, an advocacy group. Put another way, female employees have to work about 60 extra days a year to make the same amount as male workers. If businesses fear litigation, they need to study their own practices and right the wrongs. They haven’t done that and the current laws are so weak they have no motivation for change. Time to strengthen the law. Time to get this bill passed in MA House! The time has come, there is a movement here. It’s up to us to use our voices. Stay tuned to this space for who, what, where and when! Share with your friends, sign up for updates and join us. We can’t allow our legislators to FAIL us. This has being going on for too long. We must pass Pay Equity legislation here in MA so future generation won’t have to fight the same fight.